All this is a natural outcome, sadly.....of the Fallen-Adam's syndrome of the creed for money and earthly power, & TO PLEASE MEN, RATHER THAN GOD, -which always motivates all schisms and heresies, of past ages, and today, both of the rebellious and impious Popes of Rome who broke off their western part of the Universal Church starting in the 1050's, [actually that degenerative 'Great Schism" process began to take root in the late 800-900's AD ) including of their dependent & captive English Church, [the successor of the Celtic Church] and then later, in the mid 1530's, impious & rebellious and immoral King Henry VIII, though listed and as perceived by the British nation as among their 'greatest English monarchs'!.... further broke off the then Papal dependent English Church, even from heretical and schismatic Rome. Profligate and heretical King Henry [really a quasi-Protestant, not even a true Protestant in many aspects]... formulated 'his' church, according to his tastes and his preferences, and mainly ruled by himself at its head, with himself gathering all of the monies and wealth that formerly went to the 'corrupt' churches and monasteries- which anyway, did CARE FOR THE POOR and the destitute, which the 'reforming' King did not!,...and not by any pope in Rome...or indeed, by any bishop!, and in that impious process, he ordered and caused the blasphemous destruction of many centuries of saint's relics [recognized by our Orthodox Church as real & great saints] and holy shrines and MANY 'dissolved' ancient monasteries and churches, the mass looting and destruction of many centuries of sacred writings and objects, and the murder of many monastics and clergy. Wretched King Henry, truly...'Of Thrice Cursed Memory! ', despoiled and desecrated the historic English Church!... remaking it into... his own sinful and corrupt image. Now today, the successor to his vile desecrated church, which American branch is known, since we broke with our mother English country in our revolution as, 'The Episcopal Church', as is also the case with its mother Anglican Church in the UK, ruled and headed by The Queen, who seems to give her OK to just about any and all blasphemous innovations and violations of historic Christian norms and doctrines, is continuing to ..remake & DEFILE historic and patristic Christianity into its updated and 'relevant' modern re-creation, its 'One size fits all' model, aimed to PLEASE EVERYONE and to OFFEND NO ONE!...even now daring to...remake...even!.... God Himself ...newly re-defined by their updated popular criterion. They are cooking up their own, New God....by voting their new 'God' into reality...starting in their updated official Book of Common Prayer- their central liturgical & doctrinal sacred text. In America, in front of virtually every local Episcopal church [a denomination known among many other American Protestants, as 'The snobbish church of the rich upper-ruling class', is a pretty decorative sign, with their own coat of arms, which says: "The Episcopal Church Welcomes You!"........... (...i.e. no matter what you may believe or whatever you may not believe,- including what morality you may believe in, or practice in your everyday private or public lives, ....our church couldn't care less, even if you may be a total raving atheist?! JUST BE POLITE & PLEASANT & NICE!..... dress in nice clothing, and do not offend anyone!... NEVER ARGUE!!!..... and...just.... willingly... GIVE US ALL YOUR DEVOTION and ALL YOUR MONEY!... which is what is clearly meant). "The praise of men, is enmity towards God!" The Episcopal Church formed a committee Wednesday to “provide a pathway” toward revising the Book of Common Prayer to include gender-neutral language. Church leaders called for immediate revisions to correct the “overwhelming use of masculine language” throughout the book, arguing that the language is now a hindrance to spiritual inclusion, according to theEpiscopal Church website. Kathleen Moore, a seminarian from the Diocese of Vermont, said she tries to help the youth see that gendered language gets in the way of faith in God. A subcommittee was tasked with providing resolutions as part of a 12-year revision process, followed by a three-year “trial” period. Because revision of the prayer book is part of the church’s constitution, “adoption of a new book requires votes in two consecutive General Conventions to take effect, placing final approval on the agenda in 2030,” according to the church. "Let's let God be God!"......... in other words, let us remake God in OUR OWN IMAGE!!! [Episcopal News Service – Austin, Texas] The legislative committee charged with providing a pathway toward revision of the Book of Common Prayer took preliminary steps July 4 after a hearing filled with impassioned testimony. The committee – officially titled the Committee to Receive the Report of Resolution A169(https://extranet.generalconvention.org/governing_and_interim_bodies/inte...) – heard speakers say that prayer book revision is needed immediately to correct the overwhelming use of masculine language to refer both to God and to human beings, as well as a lack of imagery calling for the care of creation. Two resolutions on the Prayer Book – A068 and A069– were presented by the Standing Commission on Liturgy and Music in response to calls from the 78th General Convention in 2015 to begin prayer book of revision. Resolution A068 sets out a process of full prayer book revision, beginning in the next three years and culminating in a new authorized Book of Common Prayer in 2030. Resolution A069 offers instead a process of deeper engage with the current 1979 Prayer Book, to help members explore riches of services and prayers that are seldom used. At the end of its first meeting, which stretched to four hours including testimony and member comments, the committee created a subcommittee of six members to craft a way forward, noting both the process outlined in A068, and the need for inclusive language detailed in Resolution D036. Most of those who testified in hearings on prayer book revision resolutions called for new ways of talking about God that don’t rely on masculine nouns, pronouns or imagery. The Rev. Ernesto Medina, an alternate deputy from the Diocese of Nebraska, said that his church counted 125 masculine references in a single Sunday morning service. He urged the committee to think beyond question of revision or not, saying that the Episcopal Church “has been transformed by the Baptismal Covenant” of the 1979 Book of Common Prayer. He urged the committee to “dig deep and come up with a courageous response” to help the church share the love of Jesus. 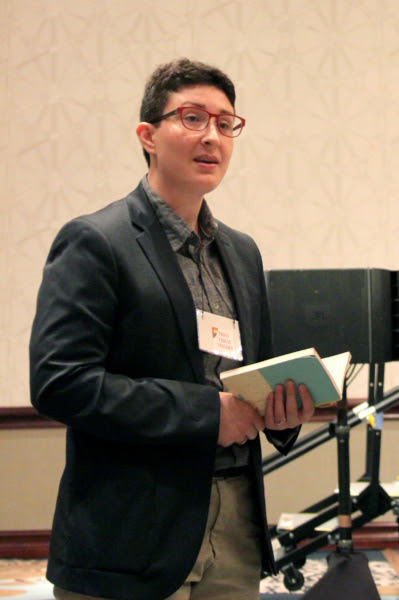 Rowan Pantalena, a postulant from the Diocese of Connecticut, said that as a non-binary trans person, “I am not your brother or your sister. I am your sibling.” Pantalena called for new liturgical language that doesn’t erase existing images from scripture and liturgy but expands upon them. Two clergy who identified themselves as transgender men, the Rev. Ian Stanford of the Diocese of Oregon and the Rev. Cameron Partridge of the Diocese of California, described how gendered language in the prayer book is an impediment to people with whom they minster. Stanford said that if he can get young people who don’t care about religion to even think about giving the Episcopal Church a try, he worries about how they will receive what they hear. “What am I inviting them into?” he asked. Kathleen Moore, a seminarian from the Diocese of Vermont, said that in her work to evangelize young people she tries to help them see that God is bigger than any human construct, but gendered language gets in the way. “Let’s let God be God,” she said. The Rev. Ruth Myers, alternate deputy from the Diocese of California, described her discomfort in presiding at the funeral for a woman and having to use the opening words of the service referring to the deceased as “he” and “him,” with its implication that being male is normative. She also noted there are no prayer book collects that refer to God’s role in creation and called for a more robust theology for creation care. Susie Burk from the Diocese of Connecticut called for adding care for creation to the Baptismal Covenant. Some who testified thought the cost – both financial and pastoral – of full prayer book revision was too high. The Rev. Jordan Hylden of the Diocese of Dallas asked how the church today could adequately revise rites to be used by the church of the future. Cost estimates are that full Prayer Book revision outlined in A068 would cost up to $9 million over nine years, and deeper Prayer Book engagement described in A069 would cost $1.1 million in the next three years. The Rev. Timothy Nunez, deputy from the Diocese of Central Florida, wondered if by 2030 the church would even need a book at all. 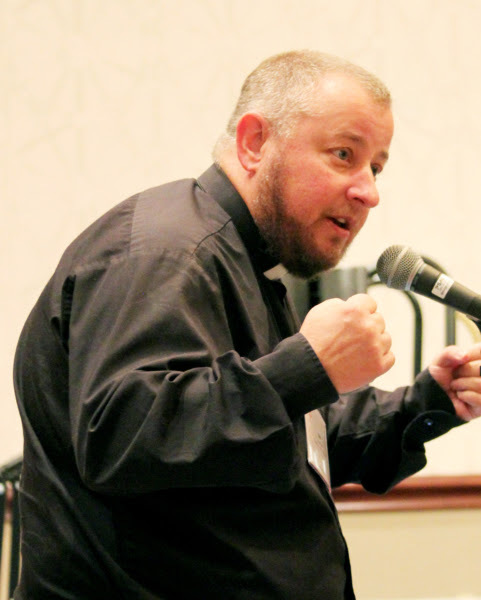 “We are going to need a more nimble way to approach liturgies to reach into the diversity of our church,” he said.